ConcordTV’s 2017-2018 Annual Report is now available. The report highlights ConcordTV’s many activities throughout the 2017-2018 fiscal year, celebrating the accomplishments of the station, and its friends, with a month-by-month pictorial journey. We think it’s a lot more interesting than your average annual report! Click here to check out ConcordTV’s 2017-2018 Annual Report. Watch the 2018 Boys and Girls Club Auction live here, Saturday, December 8th, 11AM – 9PM! Bid early and bid often! Call 603-224-1588 to make your bids, Saturday, December 8th, 11AM – 9PM. During the TV Auction, hundreds of items are auctioned live. The product is grouped by approximate value onto “boards” of nine items. The boards are sold in 2 to 4 minute intervals throughout the day. As you watch the auction, if there is an item on a board that you want, you call in and place a bid on it during the 2 to 4 minute interval when it is being auctioned. If you are the highest bidder in that time frame, you’ve won the item and your name will be announced on the air. It’s election season once again in Concord. As always, ConcordTV provides a number of ways for you to get information about the candidates running for a variety of state and local offices. Finally, over 20 candidates on our local ballot came into the ConcordTV studio to record a short message for voters. Click here to find the playlist including all candidate videos. We hope you find this information useful as you make your decisions in this year’s elections. For information on voter registration or where you should cast your ballot, check out the Concord City Clerk’s website. Make sure to get out and vote on Tuesday, November 6th! The on-screen program plus festivities will last about 90 minutes. Admission is free for children 14 and under! $5 donation for adults. Tickets are available ahead of the event through the Red River Theatres website, with a small service charge for all tickets – CLICK HERE TO GET TICKETS ONLINE. Tickets are also available at Red River Theatres, 11 South Main Street, Concord, any time the box office is open. There is no service charge for free or paid tickets at the box office. CLICK HERE FOR RED RIVER THEATRES INFORMATION AND HOURS. Parker Education is our exclusive business sponsor for this event. We look forward to seeing you September 9th as we celebrate Concord’s next generation of filmmakers! We will be carrying the Gene Connolly Memorial Service live on YouTube at 4:30 PM on Thursday, August 23, 2018. The live stream can be found below. In the case of technical difficulties, we will provide a recording of the service on this page as soon as possible. Watch live here on Sunday, October 28th! What is Concord On Air? 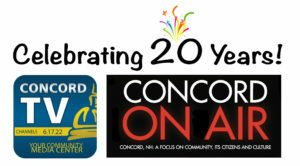 Concord Community TV (ConcordTV) is pleased to announce the 7th annual televised production of Concord On Air, an 8 hour “live” telecast celebrating the city of Concord, New Hampshire, its citizens, and creative culture. On Sunday, October 28, 2017, from 12 Noon to 8 PM, people from the Concord region, State, (and around the world) will be able to tune in to see ConcordTV’s Live televised production of Concord On Air, where the City of Concord and its people are the stars. Concord, NH cable subscribers will be able to watch this exciting telecast on ConcordTV’s local TV channels (Public Access Ch. 22, Government Ch. 17 and Education Ch. 6). And for those who are not in the Concord area, or cannot receive our channels, they will be able to watch a live stream of the telecast on yourconcordtv.org. What will be featured during the Telecast? 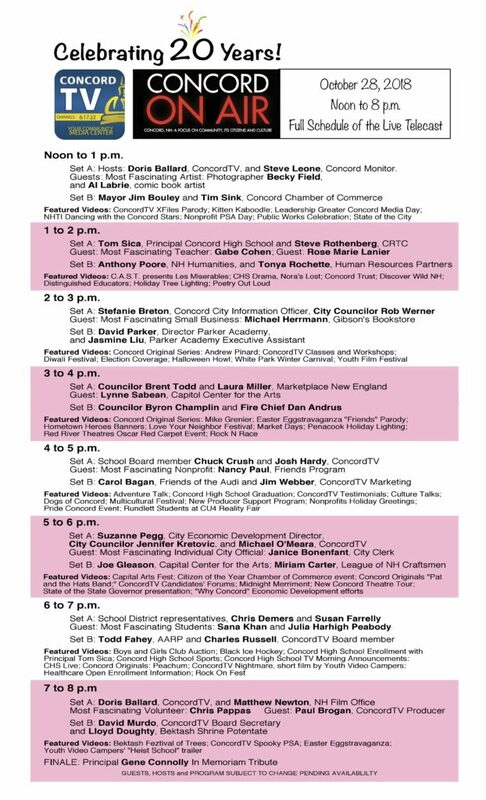 The Telecast will feature more than 70 video clips on the City’s government, schools, businesses, nonprofits, neighborhoods, and arts and culture, demonstrating to our viewers just how vibrant and active Concord, NH really is. Viewers will also get to know our city’s 2018 Most Fascinating Individuals as well as an all-new lineup of Concord Originals; working artists in our region. 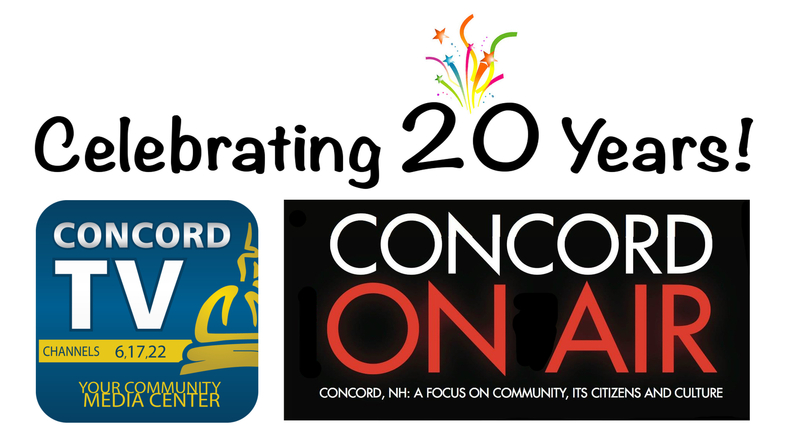 About this year’s theme: ConcordTV – Celebrating 20 Years! Focusing on 20 Reasons the community values ConcordTV as a resource, we will highlight ConcordTV’s commitment to civic communication, connecting active citizens with their city government; ConcordTV as an educational resource, making school district activities, meetings, sports and the arts available to all; and our mission to keep ConcordTV a media resource for public voices, original programming and community messaging through public access. About Concord Community TV: ConcordTV is a nonprofit organization, incorporated in 1998. Its mission is to help Concord residents, and nonprofits that serve the Concord area, learn how to: create video content that helps them “tell their stories; ” and distribute their content locally on the station’s three community TV channels and on internet marketing platforms. ConcordTV provides: On-air Community Bulletin Board for local groups and nonprofits to publicize meetings and events; Live coverage of Concord City Council, Planning Board and Zoning Board meetings; Coverage of Concord School Board meetings; coverage of community events; classes in camera, editing, studio production, marketing, and youth video and filmmaking camps. Special thanks to our friends at the New Hampshire Film Office, the Greater Concord Chamber of Commerce, and the Concord Parks and Recreation Department in helping us on this project! And we look forward to seeing all of our campers! Concord High School’s Class of 2018 received their well-earned diplomas on June 16, 2018. ConcordTV, which has its studio in the high school, and thus feels a strong connection with all of its students, was honored once again to have covered the graduation ceremony held at Memorial Field. Graduation will also play on Channels 6 and 22 throughout the summer. Looking to grab your own keepsake copy of the ceremony? DVDs are available for $25.00. Give us a call at 603-226-8872 to order. Concord sure does know how to throw a summer festival! With food, fun, and music galore, Intown Concord’s 2018 edition of the Market Days Festival had downtown hopping June 21st – 23rd. Whether you missed out on some of the great entertainment or want to relive some of your favorite acts, ConcordTV was there throughout much of the event. Check out our playlist on YouTube… We’ll be updating it throughout the summer with video snapshots of all of the great times had!